Indira and I have been sick for over a week now. We’re both feeling a bit better today though still sniffly and not quite ready to face the world full on. Our refrigerator is on the empty side so we decided to make some muffins together. 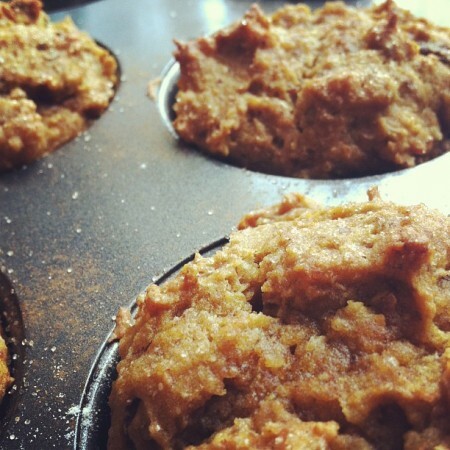 I started with this recipe for Pumpkin Muffins at Smitten Kitchen (whose recipes I LOVE) and took it from there. I used all organic ingredients, used less sugar, added a bit of brown sugar and maple syrup for a more complex flavor, added some ground flax seed, coconut, and raisins. This is what I ended up with and they came out delicious! 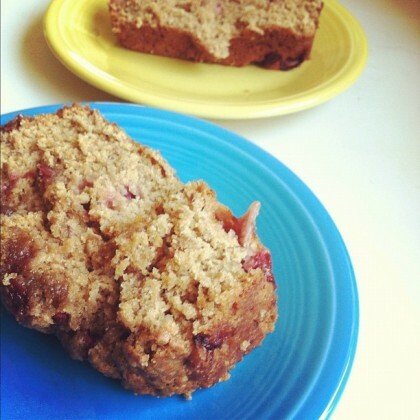 Not too sweet, super moist, and flavorful. Put oven in middle position and preheat oven to 350Â°F. Oil or spray 12 x muffin pan. Whisk together pumpkin, oil, eggs, pumpkin pie spice, 1 1/4 cups sugar, brown sugar, flax, coconut, raisins, syrup, baking soda, baking powder, and salt in a large bowl until smooth, then whisk in flour until just combined. Divide batter among muffin cups, then sprinkle tops with cinnamon-sugar mixture. Bake until puffed and golden brown and wooden pick or skewer inserted into the center of a muffin comes out clean, 25 to 30 minutes. Pull out, set on plate, and enjoy! They are delicious! We’ve been in a vortex of sickness for the past couple of weeks. Well, a combination of sickness and traveling. 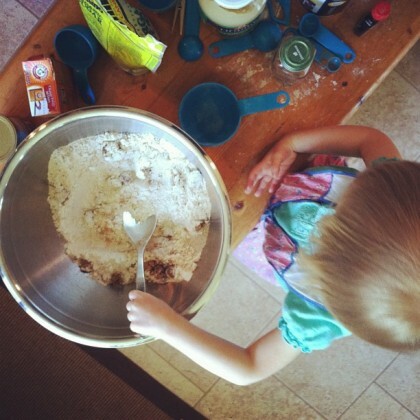 Today Indira’s ear infection has finally eased and she’s feeling better so we decided to bake! This bread came out delicious but next time I’ll try it with all applesauce (no butter) and I think it might be better as muffins or in smaller loaf pans. It was delicious though! Mix all dry ingredients in large bowl. Add butter/applesauce/oil, eggs, and vanilla. Stir with a spoon (stir until just combined, don’t overmix). 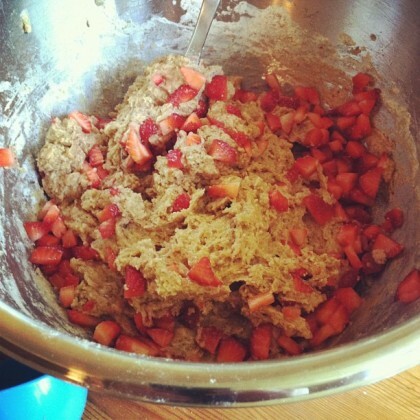 Add in strawberries and fold/mix in gently. Cook for 45 – 55 minutes. I’ve been on a broccoli kick lately. I am just loving it. Mmm! And, Dave has been on a pasta kick (his entire life) so I figured I’d try something new. We eat cavatelli and broccoli now and then but it’s new food week! I searched the internet for recipes and decided to combine the healthy and the not-so-healthy into a moderately healthy (?) version. Here goes! Bring a large pot of water to boiling for the pasta. Bring a second smaller pot of water to boiling for broccoli. Chop broccoli and slice garlic. When small pot is boiling add broccoli and boil for 2-3 minutes. Drain broccoli and set aside. Using that pot, heat olive oil over medium/low heat and add garlic slices. Cook for a few minutes until starting to brown, being careful not to burn them. In the meantime, cook pasta to al dente. Once garlic is ready, add heavy cream and sauce. I’m not exactly sure of amounts here, I just added. I didn’t want it very heavy on the tomato sauce. Bring to a boil and cook until it starts to thicken. Add 1/2 to 1 cup of water from boiling pasta. I did this little by little because I didn’t want the sauce to be very watery. Keep boiling then add reserved broccoli and cook in sauce for a few more minutes until broccoli is to your liking. At this point I added 1 tbsp of butter for some creaminess and extra flavor. 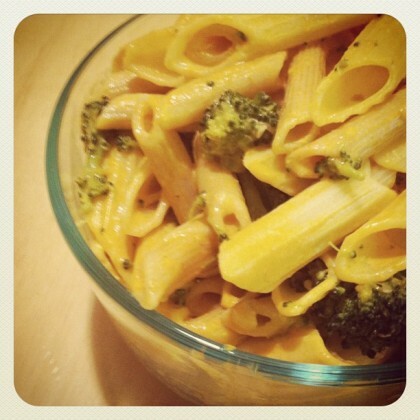 Mix saucy broccoli with pasta in the big pot and enjoy! I topped it with crushed red pepper and parmesan cheese. Delicious! 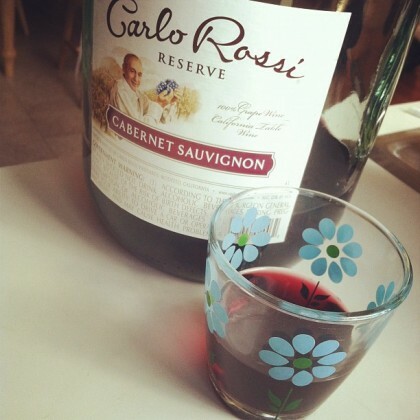 And, yes, we’ve been drinking the Rossi. Hey, it’s Reserve. Cook quinoa according to instructions (I used a rice cooker but it’s quick and easy to cook in a pot as well). Once cooked, fluff with fork and let cool a bit while you make your dressing. Squeeze the juice of a lime into a small bowl and add olive oil (I used about 1 tbsp) and white balsamic (I also used about 1 tbsp but I think 2tbsp would be better) and mix together with the lime juice (I used an old fashioned citrus juicer to really get all of the juice out of the lime) and a bit of salt and pepper. 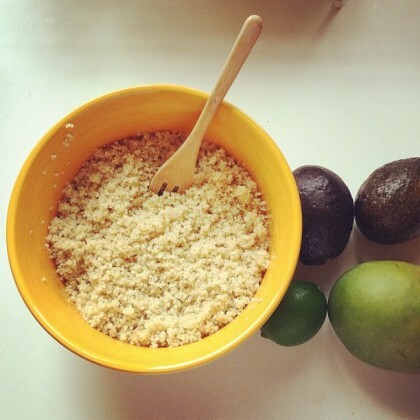 Pour onto quinoa and mix. Sprinkle some cilantro on and mix. I let this sit for a while because I was busy doing other things but I’m sure you can add the rest while the quinoa is still warm and it would be equally delicious. 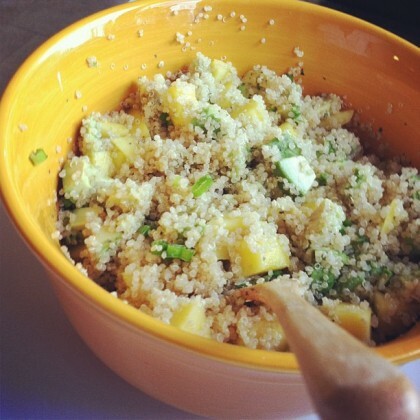 Add chopped avocado, mango, and onions, lightly mix with a fork, and enjoy! Next time, strawberries will definitely be added! 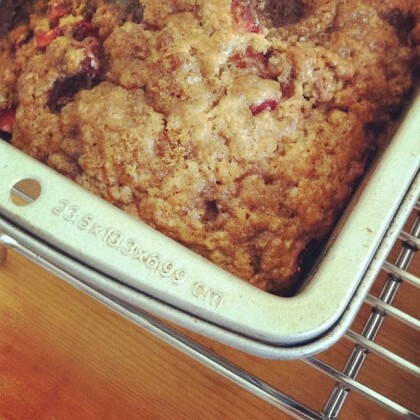 Miss the first new recipe? 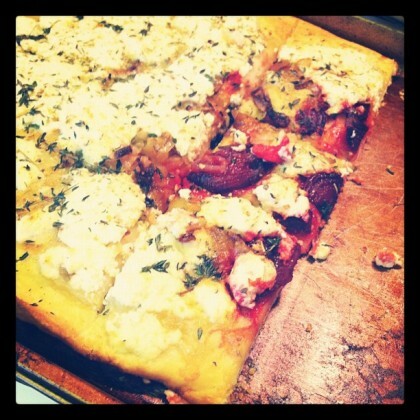 Check out this delicious beet pizza! So, cooking dinner almost every night of the week gets tiring. It gets boring. It gets tedious. And, it’s a lot different with a toddler than it used to be when I had a) money b) uninterrupted time c) quiet d) ability to drink unlimited quantities of wine while cooking. First on the menu was beet pizza. Recently, we were invited to have dinner with some new friends and they made us beet pizza with thyme and feta (I believe) and it was delicious so I had to try to replicate it. I love beets, they’re super healthy, and, like I said, cooking rut. I have made beets several times in a variety of different ways and, unfortunately, Indira is NOT a fan. This didn’t change that, but she did manage to eat most of the pizza without eating much of the beets (boo!) and both Dave and I really dug it even though neither of us is big on homemade pizza (until now!). I opted to use ricotta instead of feta because as far as I know Dave is not a fan of feta. Also, it’s a lot easier to find organic ricotta. So, here we go. I was hoping to buy a pre-made crust. Organic crust should be easy to find and not too pricey and safe for a man with allergies to anything that is processed near nuts or beans. Easy, right? Yeah, I didn’t think so. I did look. Just out of curiosity. The only ones I found were non-organic (which I would be okay with) and loaded with CRAP. I actually found one that had less than 20 ingredients but one of its five ingredients was lard. No thanks. This meant that I had to make a crust. I don’t make crust. I don’t make anything that involves 1) kneading and 2) rolling. See this bread? I make it. Often. Why? It’s knead free! But, I needed (ha!) 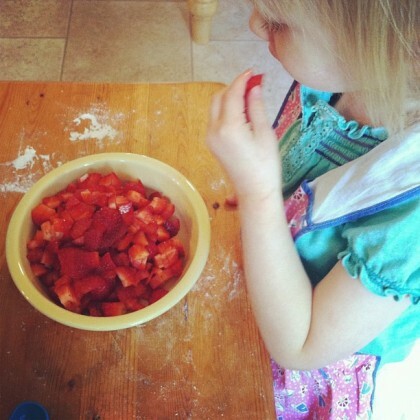 a crust so I opted for this Quick and Easy Pizza Crust recipe. All I had on hand was some all purpose flour so I used what I had. I added a bunch of italian seasoning as well as garlic powder to the liquid portion for some extra flavor. It was so easy! I ended up letting it rise in a bowl with a damp towel over it for about 30 minutes or so because I had extra time as I was burning roasting beets. I usually only have whole wheat pastry flour or white whole wheat flour handy so I’m sure this was a treat, but it came out AWESOME! And, it was so freaking easy. And, for the beets. I peeled mine, sliced them, and roasted them on a pan with olive oil at 450 for about 30 minutes. This was not a good idea. Many of them were burnt. I was going by instructions that I found online but next time I will roast the slices for 5 or 10 minutes and then take them out. Luckily, I had one beet left so I quickly roasted that one but we were a little low on beets (thus the left hand side of this pizza looking oddly beet-free). Slice and caramelize shallots. I cooked them for about 20 minutes or so in a little bit of olive oil. Slice and roast beets. I sliced mine but I’m sure diced beets would work equally well. I recommend only roasting slightly as you’ll be cooking them for 15-20 more minutes once they’re on the pizza. Prepare pizza dough. Brush with olive oil. Spread out beets, sprinkle on thyme, spoon ricotta onto the pie (I just had various lumps which was fine). Sprinkle with some italian seasoning and garlic powder. Bake for 15-20 minutes or until crust starts to brown slightly (very slightly). Enjoy!